Next Post A bad picture is worth a thousand long discussions. BUT there is alot of great magic in the WinRT bits that would be great to get access to thru WPF/SL.. The blue side is not dead BUT basically it will nolonger feel the innovations in some core key technologies and APIs’that the GREEN side gets!!!! GREENSIDE ALPHA STARTUP. BLUESIDE CUCKOLDED DEV. WHEN GREEN 250 MILLION DESKTOPS WAKE ME. I think we’re going to be referring to the ‘Green Pill’ or the ‘Blue Pill’ for some time! A nice article on the framework technology decision tree. As long as innovation doesn’t happen in the green side only, I’m happy with your interpretation. I thought the next version of Visual Studio was VS2012, http://www.vs2012.com ? j/k !! Kindly point out the useful resources to learn the new features of Windows 8 as you mentioned, “invest 20% of your time in learning about Windows 8 and the Metro style app models”. I am not clear yet in the presence of HTML5, is it need to learn WPF and Silverlight? Me too :-). Thanks for sharing. When you starve a child of food, what happens to the child? So given the uknowns, what is best for a LOB app at this point…SL or WPF? I know both will be supported for many more years, but what is the more strategic route for new apps right now? (that is, apps that can be built using either SL or WPF, apps that don’t need the features limited to WPF over SL). surely, this new WinRT is just a proof-of-concept or pilot project to test the new API model. If it will work and there would be no major drawbacks, the Windows could have similar API model in the future. Also note, that the code API model has been break up into smaller assembly-like .dll files (api-ms-win-core-1-1-0, api-ms-win-core-memory-1-1-1-1.dll) , and the immersiveshell (the UI stuff host dll) is referring those dll directly. So, apart from the WinRT thing, which can affect only small portion of the developers, the most interesting bit of Windows 8 is the refactor of Windows API. I think in the course of the time, we will see the dedicated sessions that will expand that topic. When I look at the WinRT API docs at http://msdn.microsoft.com/en-us/library/windows/apps/br211377(v=VS.85).aspx I see a lot of missing functionality that comes from .NET like System.Collections? Is that there or do Metro apps use .NET libs too? I’ll admit that I’m an outsider… I don’t get paid to code in .NET or any MSFT technology. I have thought about learning the MSFT stack, but I can’t make heads or tails of it. Especially now. I bought Victor G.’s Silverlight book and started to learn. Then, out of the blue, Bob M. says HTML/JS is the next frontier. Breaks come on, I go off and learn other stuff waiting to see what Build has in store. After build this much seems clear; Why would someone bother with learning or building expensive project in Silverlight or WPF when MSFT is clearly pushing the giant “green box”? C++ and HTML/JS are in the same green box. That is either pure genius or suicidal. SL / WPF are in a tiny little corner, relegated to “classic.” Wasn’t SL the future just 3 or 4 years ago? How many dev’s can afford to spend 3 or 4 years on a platform that has promised the world, only to be pushed to the back of the line in one fell swoop? Yes, the world of developing is always changing… but generally its incremental and over longer periods. MSFT needs some stability for the dev’s sake. >>In this diagram there is a green side (Metro style) and a blue side (Desktop Mode). While it is not depicted here, there is a big fat solid wall in between the two sides. That which runs in the green side, cannot run in, nor access anything in the blue side, and vice versa. 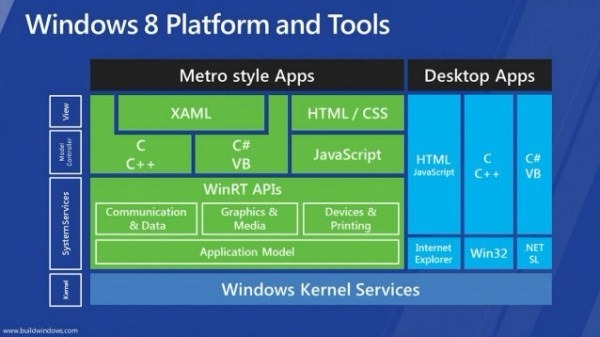 Apps you build for Windows 8 are either Metro styled apps or Desktop Mode apps. There shall be no comingling. This is a great design. Some apps should never be Metro styled apps, and some apps should ONLY be Metro styled apps. The wall of seperation only seems to one way. It looks like Metro apps have full access to normal .NET libraries. I posted earlier wondering about missing classes in WinRT so I made a simple C# program with VS11 and used Dictionary. The compiler tells me that the class is implemented in .NETCore\v4.5\Systems.Collections.dll. So apparently Metro apps can use .NET. The wall prevents desktop apps from using WinRT (maybe). Check out my post (https://dougseven.com/2011/09/15/a-bad-picture-is-worth-a-thousand-long-discussions/) – there is a brief description of why you have to give up some parts of .NET in the green side (Metro style apps). Nice post – thanks for clarifying some points about Desktop applications. What I want, though, is a better way forward for Desktop applications. I’ve got a MFC/C++/Win32 desktop app with a lot of functionality. I’d love to keep using C++ everywhere in the app, replace MFC UI with XAML layout, and use WinRT for fast Direct2D-based rendering. Except now I have to take the “green pill” and get the Metro “styling” too! Microsoft needs to show us how they plan to innovate on the Desktop side if they truly believe the Desktop is not “legacy” and we should all just write Metro apps. Still what about XNA? And is the Xaml support in Metro the Xaml from SL or WPF? Any ideas? There is no XNA support in Metro style applications. DirectX is the solution for immersive games. To reword my question (not trying to be dense or stir a scene), but XNA is an excellent platform for games. Why not include it? (I guess thats more rhetorical…) Still w/o having the chance to dive into the dev preview yet are we in a third version of XAML or are we using a preexisting base from SL or WPF? Obviously they are both still supported on the Desktop, that’s great. But what is Metro XAML? Can’t seem to find the answer to that yet. Nice article and it helps a lot. What is frustrating however, is that SL developers have been anxiously waiting for direction for months and we were under the impression that all would be revealed at Build. However, what we end up with is more “leaving us in the dark”. Sure we realize we can still build things for Windows 8 with SL, but the message is far from clear as can be seen by a whole new slew of blog posts about “Silverlight is dead” and other misinformation like posts by Mary Jo Foley. I appreciate posts like yours that help to clarify the situation, but clearly Microsoft is not listening to developers who have repeatedly asked for clarification about the future of Silverlight and WPF development. Hoy estoy en una encrucijada, ya que estoy migrando una aplicacion web .net 1.1 to Silverlight 4, EF 4.1 and RIA Services.¿Que debo hacer?. ¿Debo Replantear este proyecto de migración? e irme por MVC3. Me gustaría mucho su opinión colegas. Today I’m at a crossroads, as I’m migrating a web application. Net 1.1 to Silverlight 4, EF 4.1 and RIA Services. What should I do?. Should I rethink this migration project? and go for MVC3. I’d love your opinion colleagues. Well we are an example company we were just about to allocate 3 million in funds to develop a SAAS based application that was to use Silverlight and we were going to adopt Windows Phone and Windows pads on the basis we would have high levels of code reuse and we believed we could provide enough value for businesses to change out to the Microsoft products over Apple and Android. The reason we were doing this was because we wanted a unified development approach where we could use Silverlight for all platforms, Phone, Table and Desktop. We were told over a year ago at TechEd that this would happen. After Build I have now cancelled the use of Silverlight altogether as there is no value in it any longer as far as we are concerned. We will use WPF for our desktop application instead and we have abandoned all plans for Windows Phone and the Microsoft Tablet and no longer intend to support them in the future at all. We will support iPhone and Android instead if we have to write native apps we want it with companies that have market share. In all Microsoft will lose a huge amount of business from this decision as there are many other people that I am talking to that are just as shocked as I am by this. Certainly it is hard to do business with a company that is so short sighted. Microsofts core business is Companies i.e. The business community. Companies write Line of Business applications. What they have produced here is solely for the consumer market and created a huge amount of uncertainty for the business market and ignored what is a veritable pot of god that they could have had by providing a unified development environment for all platforms. When you have a business partner that refuses to explain their actions or provide a roadmap you simply stop dealing with them or you reduce your level of exposure to them. There was a time where Microsoft products provided the additional value that warranted the prices they asked. That time has now passed. What we are left with is a rudderless ship lurching from one disaster to another. Think Vista another stupid decision that only got reversed when people voted with their wallets and refused to buy it. Microsofts pitiful attempt to try and lock developers into the WIndows Platform through HTML5 will be seen through and anyone with any sense will use something like SproutCore instead to ensure their software works across all platforms. All I can say is what a waste and what a missed opportunity by Microsoft. Even if they changed their minds I would not go back as they are simply a fair weather friend and cannot be relied upon in the longer term. P.s. We were also going to buy the Telerik tools for Silverlight for 30 developers as well, so it affects Microsofts business partners as well. thanks for the info. This gives me some more confidence to push ahead with our current plans. It was good to hear from a solution provider (above). I still agree with Alan, and am dissapointed that the write once in Silverlight for several targets will not be realised. Perhaps Telerik would also consider doing some work with Xamarin? The Telerik commitment of starting WinRT work now is a welcome one. That would be awesome. If MS can deliver on their goal of getting momentum in the mobile & tablet market, then this will be a very good thing… and I *may* forgive them for appearing to back Silverlight strongly until MIX11. I actually delayed a HTML5 deployment because Firestarter was so compelling. I can only assume that Microsoft are going to continue to look after their business clients given that to date this has been one of their strengths. btw: part of looking after business clients means providing clarity of vision and a little marketing muscle so that we don’t have an even harder job of attempting sell our work to organisations. where did you see a 10 year support life cycle for Silverlight? Silverlight support is subject to 12-months notice from Microsoft. This is primarily to enable them to release new versions and discontinue support for older versions. Visual Studio 2010, however (which includes tools for building Silverlight and Silverlight project types), will be supported through September 2020. I heard an MS guy say “10 years” and quote that Winforms is still with us as an example just a few months ago… but your MS link contradicts this. I still appreciate your article. However, there is no caveate like you suggest in this statement written in semi-legalese — and that’s important. Lawyers tend to put a lot of thought into these statements. They’re a fairly articulate bunch. Is it a mistake? Previously, I was very impressed by Scot Gutherie’s emphasis on look what they had achieved in a few short years. We wanted to align ourselves with that. It was like wow both on the engineering, and the commitment. At this time there is no public comment that I am aware of from Microsoft regarding Silverlight. They emphasise HTML5 and XAML. It’s been six months since the rumours began at MIX 11. They must have thought about it. Have there been forced marches from MS before?